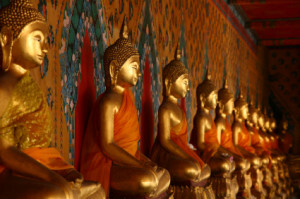 The Certificate in Theravada Buddhist Studies is intended for two types of students: (1) IBS degree (MA, MBS, or MDIV) program students who wish to demonstrate a knowledge of Theravada Buddhist studies, history, and practice; and (2) students from outside the IBS, particularly Theravada practitioners, who wish to enhance their engagement with the tradition and their communities by obtaining a systematic graduate level education in Theravada Buddhist studies. The certificate is offered in cooperation with the Sati Institute of Theravada Studies and overseen by the Program Director, Dr. Diana Clark, in cooperation with Dr. Scott Mitchell, Dean. Degree program students wishing to complete a concurrent certificate program must contact the Registrar for the requisite form. Non-degree students must apply for admission by the published deadline. Application requirements include transcripts, letters of recommendation, a statement of intent, and an application fee.